Professor King-Kok Cheung of the departments of Asian American Studies and English is the 2012-13 recipient of the C. Doris and Toshio Hoshide Distinguished Teaching Prize in Asian American Studies at UCLA. Cheung is author of the critically acclaimed "Articulate Silences: Hisaye Yamamoto, Maxine Hong Kingston, Joy Kogawa" (Cornell,1993). Her research fields are comparative American ethnic literatures, Asian American literature, comparative literature and Renaissance British literature. 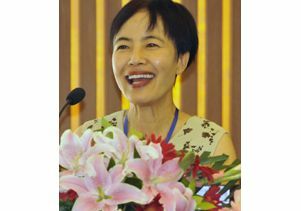 She has published widely in leading journals such as American Literary History, MELUS, Milton Studies, PMLA, Positions: East Asia Critique, Shakespeare Quarterly, and Transnational Literature. She also served as the director of the University of California EAP Study Center in Beijing (2008-2010). "The level of support for Professor Cheung was exceptional," wrote David Yoo, professor and director of the Asian American Studies Center. One writer of a letter of support noted: "In the interdisciplinary field of Asian American Studies, she is arguably a 'titan,' having earned an honorable reputation that any aspiring and established scholar would envy. Nevertheless she maintains humility, appreciating the value of student input as well as the importance of a dialogical, rather than directive, pedagogy." The late C. Doris Hoshide, Class of 1934, of Rockville, Md., established the teaching prize to recognize an outstanding professor in Asian American Studies. She and her husband were longtime supporters of Asian American Studies at UCLA. The Hoshide Prize includes a $1,000 award.